When Pastor Ron Steel recently preached on Psalm 23, he called it the most beloved, but also the least believed. He also pointed out that it is the middle of three psalms that speak about Christ as our suffering Shepherd (Psalm 22), our sufficient Shepherd (Psalm 23), and our sovereign Shepherd (Psalm 24). I highly recommend Pastor Steel’s excellent sermons on Psalm 23, which can be heard here (7-15-12 PM) or here (August 19 evening worship). He leads me beside still waters (Psalm 23:1-2, ESV). for his name’s sake (3, ESV). Our Lord cares for the physical and spiritual needs of his flock. His Spirit renews our hearts through regeneration. When we despair and our faith is weak, God restores our souls to rejoice in his goodness. 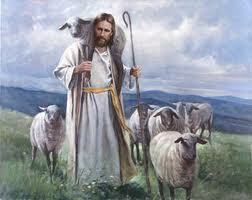 Our Good Shepherd guides us along the way of righteousness, so that we live for the glory of his name. they comfort me (4, ESV). On life’s journey, we often confront terrors that threaten to destroy us. We frequently face the last enemy of death. But remembering God’s continual presence helps us to face our dark valleys without fear. A shepherd uses his staff to poke the sheep and turn them onto the right path. He uses a crook to pull them from ravines into which they blunder. Such guidance or rescue is undoubtedly uncomfortable, but David realizes that even unpleasant or painful direction is from God for our good. And that comforts him. my cup overflows (5, ESV). The liberal host in David’s day would have anointed an esteemed dinner guest with fragrant oil. Even though we may feel as if enemies are cutting off our supplies, the Lord is preparing a full course dinner. He sees to it that we sit down at the laden table to partake of his delights. And as if that is not enough, he anoints us with the oil of extra blessing. Our cups of thankfulness ought to overflow! God’s goodness and mercy are never far from us. They will be with us through every remaining day of our lives. We can worship in God’s house now and we will dwell with him forever. No wonder this is such a beloved psalm! But do we really believe it? Do we truly trust God to fulfill all our needs? To dispel the shadows of our dark valleys? To feed us a feast while our enemies watch? And to go so far as to anoint us with fragrant oil in their presence? May God enable you to love this psalm because you believe it!